Do you need a home for that brand new plasma screen home theater? A new stereo system with surround sound? An entertainment center that sits at the foot of your bed, with your TV popping up for viewing via remote control and disappearing g back into the cabinet when it’s time to drift off? Well, we can help. 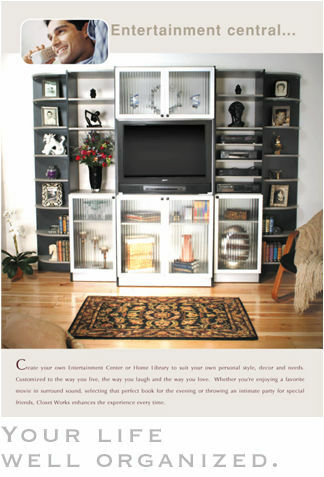 The Closet Works builds custom home entertainment centers to suit your room, your equipment and your taste. Traditional, contemporary or transitional styles are all possible with just the right configuration to accommodate your audio/visual equipment and accessories. Whether you need bookshelves, or display space or storage for CD’s, DVD’s or tapes, we can create a completely custom solution for all of your storage needs. Glass doors? Raised panel doors? Drawers? Rollouts? Whatever it takes to make your home entertainment area the best it can be, we can provide the cabinetry, at a price that can’t be beat.